Have we witnessed the beginning of a revolution in rocketry? On Sunday, the SpaceX company launched the latest version of its Falcon 9 vehicle from California, placing a cluster of small satellites in low-Earth orbit. The new vehicle has been given the additional performance it needs to start lofting commercial telecoms spacecraft and other payloads, and nearly all of these modifications appear to work just fine. But it's what happened to part of the rocket after it had completed the primary mission goals - as it fell to Earth - that really has everyone talking. Normally, the first-stage of a rocket – the segment that gets it up off the ground – is discarded at altitude, whereupon it begins a destructive dive back through the atmosphere. Aerodynamic forces tear the tumbling object apart. This is the history of rocketry – everything is expendable. SpaceX, though, has plans to try to recover these stages in good working order, to refurbish them and to put them back on the launch pad. If the company can succeed, it would have a major impact on the cost of access to space. Expendable rockets would become reusable. Parts of them, certainly. To this end, Sunday’s first-stage was commanded to reignite three of its nine engines after separation from the rocket’s upper-stage in an attempt to slow its return to Earth. Then, as the stage got closer to the Pacific Ocean, it fired up a fourth engine to limit the descent speed still further. SpaceX CEO and chief designer Elon Musk promises to post video on the web later this week showing what happened. Although the stage lost some stability as it approached the water, the entrepreneur expressed great satisfaction with the way the experiment went. “In this case, the boost stage did not have landing gear, which helps essentially to stabilise the stage like fins on an aircraft. “The stage actually ended up spinning to a degree that was greater than we could control with the gas thrusters, and it centrifuged the propellant. It caused the boost stage to run out of propellant before hitting the water. So it hit the water relatively hard. Those "pieces" comprise the lessons learned from Sunday and the results garnered from SpaceX’s Grasshopper programme, in which a Falcon first-stage has executed precision take-offs and landings from a pad in Texas. A number of videos illustrate these hops. Note the landing legs. Retractable versions will now be incorporated on to the Falcon 9 that launches the company’s next Nasa cargo mission to the space station from Florida at the beginning of 2014. And again, once the first-stage has completed its primary tasks on that flight, it will be commanded to reignite its engines and to make a controlled return to Earth. But it won’t drop into the ocean. This time, the boost stage will try to touch down on a piece of ground at Cape Canaveral not far from the launch pad. SpaceX is currently working through the technicalities with range officials at the Cape, and with the Federal Aviation Authority. An FAA licence will be needed before such a landing is permitted. Obviously, with a load of kerosene fuel onboard, all matters of safety will have to be satisfied first. “For any landing area, the landing ellipse - the error that the stage could encounter - would be an unpopulated region,” Musk tells me. "We would aim to have a landing site that’s unpopulated with a radius of probably a couple of miles." SpaceX’s Falcon 9 rocket is currently being offered at about $54m a launch. That is very competitive by today’s standards, but it would be substantially cheaper still if elements of the rocket could be recycled. 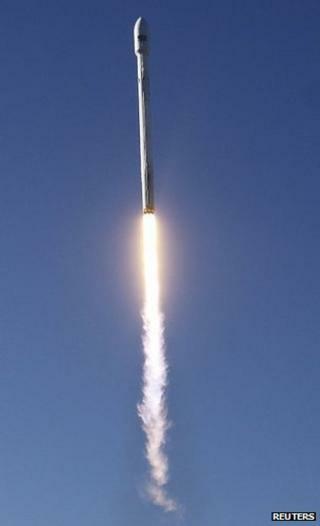 The company says the first-stage represents almost three-quarters of the cost of a Falcon 9. Clearly, in carrying extra fuel and landing gear, you take a hit on the rocket’s performance – the maximum payload you can carry to orbit is cut by about 30% if you try to return the first-stage to the launch site, says Musk. But the imperative is clear. “In terms of when we actually refly the stages, it’s going to depend on what condition the stage is in, and obviously getting customers comfortable with that,” Musk explains. "If things go super-well then we will be able to refly a Falcon 9 stage before the end of next year. That’s our aspiration."